Bloodroot is one of the earliest wildflowers to bloom in our area and is found in moist woodlands and flood plains. 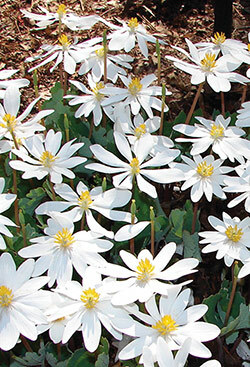 The flowers are relatively large and showy for such a diminutive, ground-hugging plant, with 8-10, crystalline-white petals that surround a burst of golden stamens. They are exceedingly beautiful but short-lived, often lasting only a few days.